Down early, Texas was unable to catch up to Texas A&M in a 9-6 loss at UFCU Disch-Falk Field on Tuesday. The three-run defeat snapped a three-game winning streak for Texas, which is 4-2 against teams from the Southeastern Conference this spring. Ranked 12th nationally, Texas dropped to 20-12 following the loss to the No. 9 Aggies (24-6-1). The Longhorns, though, didn’t have much time to sulk afterward. Following the game, Texas players still signed autographs for fans. Head coach David Pierce fulfilled his media obligations. Lance Ford and Austin Todd greeted former high school teammates who now play at Texas A&M. The team’s attention also turned to its upcoming series against a 21-win Baylor team. Pierce noted that “the difference in the game is they’re more experienced than we are right now in some areas. Our young guys got exposed a little bit tonight.” Texas had two freshmen in its batting order on Tuesday. Five of the six pitchers who threw were either freshmen or sophomores. UT’s growing pains were evident. Freshman Eric Kennedy misplayed a sixth-inning single, and Texas A&M’s seventh run was scored after the ball bounced over the left fielder’s head. Two home runs were surrendered by Owen Meaney during the freshman right-hander’s two-inning start. After a 1-2-3 eighth inning, freshman Ty Madden loaded the bases in the final frame before sophomore Kamron Field surrendered a two-strike, two-out single that scored the game’s last two runs. Tuesday’s game was played in front of an announced crowd of 7,952, which was a regular-season record for UFCU Disch-Falk Field. Last year’s NCAA regional between the Longhorns and Aggies drew a crowd of 7,046. Texas trailed 7-1 after the Aggies batted in the sixth inning, but a Longhorn team that had walked off to wins in two of its previous three games made things interested. Senior Michael McCann hit a three-run bomb that pulled the Longhorns within 7-5. In the eighth inning, the Longhorns scored on an error but left the tying run at third base. A clutch hit from Logan Foster, however, gave Texas A&M some breathing room in the final frame. Texas went down in order during its final at-bat. The loss was UT’s fourth in nine midweek games this season. In 2018, Texas went 11-3 in regular-season games that weren’t tied to a weekend series. The Longhorns were 12-2 in those contests during Pierce’s first season in Austin. Around the bases: With Texas down to one healthy catcher, redshirt freshman catcher Turner Gauntt rejoined the team ahead of Tuesday’s game. Gauntt was cut ahead of this season, but he takes the roster spot opened by Alec Carr’s preseason transfer. … Todd went 3-for-4 with two runs. 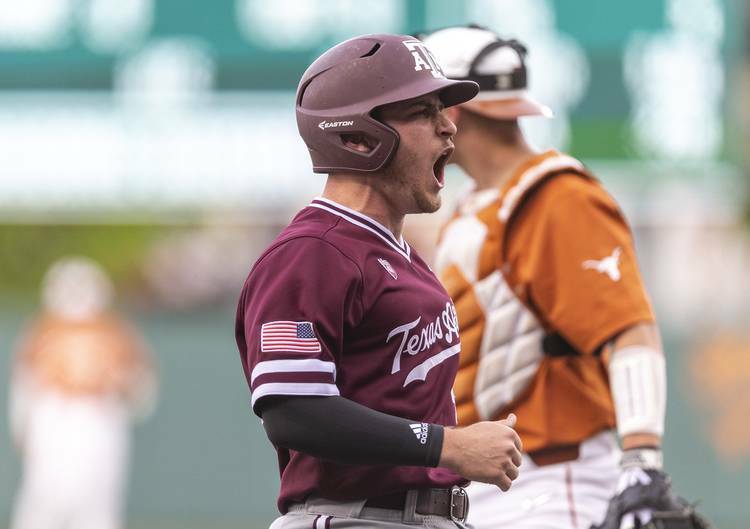 Cam Blake, Todd’s ex-Round Rock High teammate, had two hits for Texas A&M. … Aggie closer Kasey Kalich earned this seventh save of the season. … Texas gave up 14 hits and four walks. The Longhorns committed two defensive errors for a third straight game.